Modifications: I didn’t use olives in the “olive salad”, which probably makes this not authentic but I don’t really care. Neither Erin nor I like olives. I also did not use the mortadella, because that is always the stuff that looks so gross at the deli case. Time to table: 15 minutes prep, 3 hours waiting time. Notes: I came by this recipe when Bill posted about their muffaletta experience a few months ago. I drooled over his picture for a long time before finally getting around to trying it ourselves and this was a fantastic sandwich. I wish I would have used more oil in our olive salad so that more would have soaked into the bread. 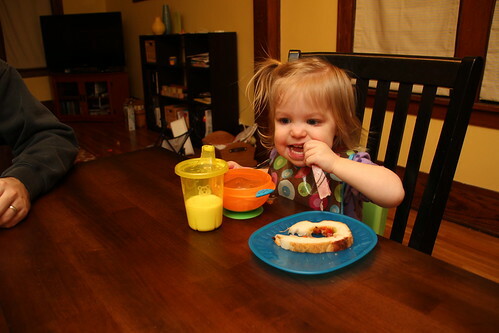 Annie promptly took hers apart and ate just the meat and cheese first before going after the bread. 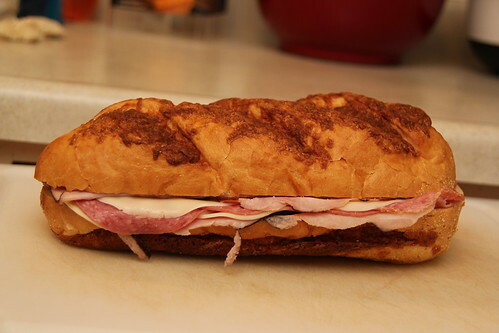 This entry was posted in bread, celery, cheese, ham, red pepper, salami, shallot. Bookmark the permalink. Kim and I love these and I’m glad you guys did too. We’ve been using the focaccia from Cub (it’s on sale for $1.99 sometimes) and add a ton of different veggies to the mix of olives (roasted red peppers, pickled carrots, some spicier peppers, etc). The last time we made it we let it sit overnight as our leftovers from the first time were far better than our first sandwich. Kim also put a plate on top to help press the olive mix into the bread and get it to soak up more of it. Instead of mortadella just use bologna. It’s cheap and it’s basically the same thing. We’ve tried a bunch of different meats and cheeses each time and, honestly, doesn’t matter what you use it always ends up tasting awesome. I’m totally making this soon. 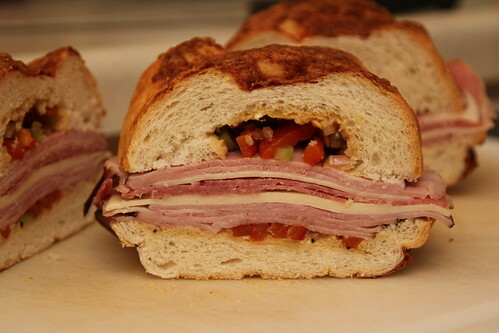 I’ve been in love with Muffaletta’s ever since we went to NOLA a few years ago and had one in the French Quarter. And I found a decent one in KC the last time we were down there, but have yet to find a good one here. I just had the leftovers for lunch and they were delicious as well. I’m going to make this again soon (for myself if Erin doesn’t want it that soon 🙂 using Bill’s suggestion of adding more pickled vegetables to the mix. I also want to try using the correct bread next time.